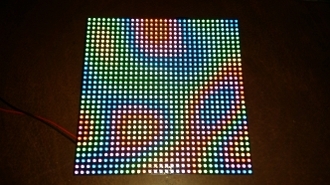 This is our Aduino Mega based 32x32 RGB Matrix panel Smart Display. It brings the Arduino brains to these gorgeous panels and allows you to control them via simple serial commands. It comes fully Assembled & Tested. It can operate by itself or control other Drivers. NOTE: If you do NOT need to communicate to it via Bluetooth (or have more expansion abilities), and want to save a few dollars, you could select the 32x32x1 Basic Matrix Turnkey instead.